On Tuesday, March 26th, Family Services Windsor-Essex Volunteers in conjunction with @LAFWindsor, @UnitedWayWE, and @ourwestend hosted a very successful FREE Income Tax Completion Services Clinic for over 120 local people with low to modest incomes and simple tax returns. Hear more about the event from @RVenezaCTV and Jim Crichton, at CTV Windsor News and pick the CTV News at 11 show for Tuesday March 26th. The segment runs at the 1.14 minute mark. Family Services Windsor-Essex participates in CRA’s Community Volunteer Income Tax Program as tax filing can be a challenge for many people, which can negatively impact their income. 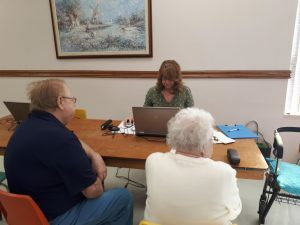 By providing the FREE Income Tax Completion Services, FSWE Volunteers are helping to ensure that people with modest incomes in Windsor-Essex have their simple, personal tax returns completed, at no charge, on an annual basis which ensures that they are accessing all available government benefits to help maintain or increase their incomes. Click here, for more information about FSWE’s Income Tax Completion Services and to find out about upcoming Community Tax Completion Clinics. Need to Talk? We can Help. Contact us today at 1-888-933-1831 and info@fswe.ca.